JERUSALEM -- As Israel marked its Holocaust memorial day, Prime Minister Benjamin Netanyahu compared Iran to the Nazis on Wednesday and warned the Islamic Republic must be prevented from obtaining nuclear weapons. Israel views a nuclear-armed Iran a threat to its very existence, noting Tehran's support of Israel's bitterest enemies such as Hezbollah in Lebanon and Palestinian groups Hamas and Islamic Jihad. "Instead of demanding Iran significantly dismantle its nuclear capabilities and conditioning lifting sanctions on it ending its aggressions, the world powers are retreating, leaving Iran with nuclear capabilities and even allowing it to expand them later on regardless to its actions in the Middle East and around the world," Netanyahu said. Netanyahu has been one of the most vocal critics of world powers' tentative deal with Iran to limit its nuclear program in exchange for a reduction in crippling economic sanctions. Tehran and world powers reached a framework agreement on the deal earlier this month. A final deal is to be finalized by June 30. Six million Jews were killed by German Nazis and their collaborators in the Holocaust, wiping out a third of world Jewry. Today, fewer than 200,000 elderly survivors remain in Israel, which was created just three years after the end of World War II. On Thursday morning, Israel will come to a standstill as sirens wail for two minutes. Pedestrians typically stop in their tracks, and cars and buses halt on the streets while drivers and passengers stand with their heads bowed. 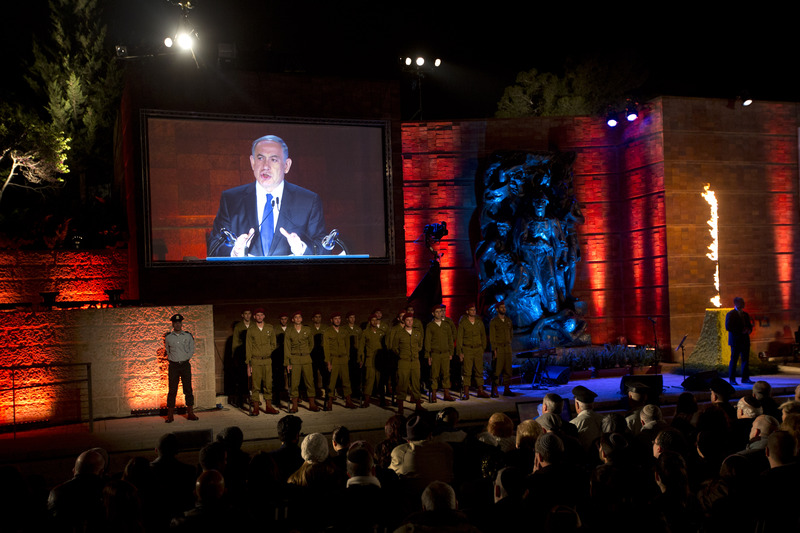 Wednesday night's main ceremony at Yad Vashem, at which Netanyahu spoke, included six survivors who lit six symbolic torches to commemorate the 6 million dead. One of those was Shela Altaraz, the youngest of four children from Macedonia, whose whole family perished in the Holocaust. During the war, she briefly found sanctuary in a Muslim village before falling ill with typhus and taken to a hospital. Eventually, she was put in a concentration camp where she was the only child. She would wake up screaming from nightmares but never uttered a word, earning the nickname "The Mute." "I'm angry at the world for not understanding and denying what happened and I am angry at myself for staying alive when so many others didn't," she told The Associated Press. "I still live those days as if they were today but I'm proud that I live in a country where they cannot chase us anymore."